One of the reasons it may be a well-kept secret is that it was quite basic in its first appearance in PowerPoint 2002 (aka PowerPoint XP) but was still a little clunky and inflexible – you could not change the size of the panes for example, so if you had very visual slides and lots of notes, you could not always see them properly. So even those who discovered or read about the feature may have soon given up on using it, and not passed on the idea to others. 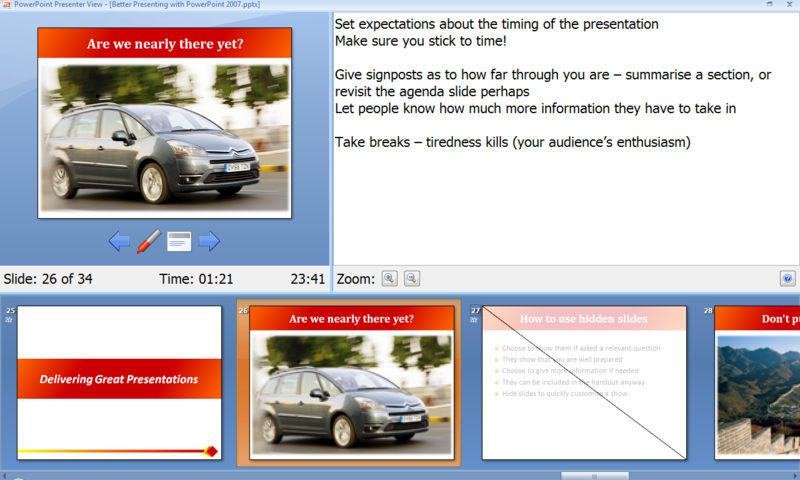 A screenshot of Presenter View from PowerPoint 2003 is shown below (click for larger version). The whole layout was radically overhauled and made more flexible in 2007 – you can resize the three main areas (slide, notes, ‘film strip’), as well as zoom the notes area to make text smaller or larger, a great help if you need to stand further away from your main screen. This same layout has been retained for PowerPoint 2010, as seen below. How do you turn on Presenter View? First you need to set up your Windows desktop so that you are using both physical screens and showing something different on each (not a duplicate). This might be your laptop and a monitor on your desk, or a projector in a meeting room. Second, you set up the slide show in PowerPoint to use Presenter View, although if someone has already done this last time and saved the file, it should have the option already ticked. In Windows Vista and 7 press the Windows key + P, which brings up a set of four options as shown below – you need to choose “extend” so that you now have one super-large desktop which stretches across your main screen and secondary one. Most laptops have some kind of keyboard shortcut to do something similar, such as Fn + F7, but in general I find that the Windows option tends to give better results, particularly if the two screens have very different sizes or aspect ratios (eg a widescreen laptop capable of 1280 x 800 or higher with a 4:3 projector running at 1024 x 768 or similar). The built-in hardware switch tends to be a bit more “dumb” and may end up squashing one screen or stretching the other, or simply not using the whole of the available area (often limiting your lovely large widescreen display with black bars down either side). With Windows XP the keyboard option is often the quickest, although some graphics cards had specific tools provided with their drivers to make it easy – simply right click on the desktop and look for choices such as “graphics options” or “display tools”. Failing all of those, choose “Properties” then go to the “settings” tab and set up the displays in there. In PowerPoint 2002 or 2003, go to the Slide Show menu, choose “Set up show” and look for the option labelled “Show on” you can choose the appropriate screen from there. That simply makes sure the show turns up where it should (usually a projector). You need to also tick the box to “Show Presenter View” if that is what you want. In 2007 and 2010 simply go to the Slide Show Ribbon and the options are directly shown there (which means it is obvious if someone has already set this correctly). In all cases, you can’t tick the box for presenter view if you do not already have the system set up to use a second monitor (you will get an error explaining this and a prompt to check you system, which will take you to the screen resolution dialogue so you can change things there if needed). Once you have ticked the box and save your presentation, it will remember this setting next time you use the same slide show. Do make sure you test this out before your audience walk in to be sure the presentation appears on the correct screen. Also take this opportunity to adjust the size of the three areas by dragging their boundaries, and make sure this is suited to where you will actually sit or stand to present from. Is this really such a secret? I recently gave a keynote speech about presenting skills (not specifically about PowerPoint, but rather the “soft skills” side of things) to a large audience, many of whom were in middle or senior management positions, and several in sales or marketing roles. Lots of them asked in the break afterwards how I had been able to present for an hour without any reference to notes or cue cards (it was clear I was not reading from the projector screen since there were barely more than 100 words across more than 30 slides in the whole show). None of them had seen Presenter View before, and once shown how it could be used they could immediately see how it would make their jobs easier and their presentations appear much more professional. Even if you are well prepared and don’t actually need to read from your notes, simply knowing they are there can help calm the nerves of timid presenters. I also find that because I tend to use visual slides with very large images I can stand well back from the screen and can still see enough to know what is coming up, and this helps segue smoothly from one topic to the next. (Bonus tip: many people practice every slide again and again, but often forget to practice the bits that join it all together into a single seamless presentation. Practice these joins and Presenter View will help remind you what is coming up so you can present more fluidly, and your audience will follow more easily). If you regularly give presentations, with or without PowerPoint, you may like to take a look at my recommended reading list for people who present, which includes several books on presentation design, some on delivery, and others on improving communication of ideas in general. I have been using PP presenter for years. The recent programs have taken a large step backwards with respect to using presenter view. In 2003 version there was the next up window which let you see the title of the next animation. For using notes the up and down arrow keys scrolled through notes. Those two features are very necessary when presenting a complex lecture with many notes and many animations for each slide. Further PP has still not dealt with the notes features, printing notes without slides, placing flags in notes that remind when animations are used. I find PP 2010 just primitive and frustrating. The necessity of taking your mouse and going to the notes scroll bar during the lecture to get to all your notes is just dumb. So many things could be improved that it makes me wonder if PP is just used for simple presentations that have little complexity. I have used PPT presenter for a number of years in a different context from what you have descritbed. I run tech for my church and my setup is: Monitor 1 – Actual PowerPoint Softward/Slides display; Monitor 2 – PowerPoint Presenter View; Monitor 3 – Auditorium screens on which ppt slides display. In 1997-2003 PPT Presenter View, when I advanced slides the Monitor 1 display would also advance to the next slide so that I could see all the animations (if present) contained in that slide – helpful as some animations are timed while others require a mouse-click to activate. Just obtained a new computer last week with upgrade to PowerPoint 2010 and PowerPoint Presenter 2010 — no longer does the Monitor 1 PowerPoint display advance slide by slide in conjunction with the advance made in Presenter View. I’ve looked for setup options, but cannot find. Anything I’m missing? This is extremely frustrating if it cannot be fixed . . . thanks for any feedback, direction given. Yes, PP2010 took a big step backward. Another glaring mistake was that in PP2003 you could scroll through speaking notes using the up/down arrows. Now you have to use a mouse, just a pathetic nuisance. It seems that Microsoft has just left this feature underdeveloped. There are so many features they could add to make it usable. New animations are not what we need. It would help in editing if the animation names and titles were consistent between the selection pane and the animation pane. Also some animation keys in the speaker notes would be helpful. Oh well. So the Technical Preview of Office 2013 is out, and loads of people have obviously seen the same launch presentation and are avidly reporting that PowerPoint has this really cool new feature called Presenter View as if this has not been around for 15 years already. I guess they mistook the phrase “New presenter view” which may have been used because it has a facelift. Awesome – a timer on screen as well! Just like before, you get time of day and time elapsed. Yes, I get that the new zoom feature is probably quite handy, but until we get Notes which you can actually format and have them show up like that on screen (even bold and a couple of colours would be nice) we are not moving forwards. I think you have stuck on the key. People are just not using Presenter’s View and therefore they are not noting and reporting the problems that assist in actual development of this software. I ran across someone the other day who had never used cruise control in their car. They were amazed, Microsoft needs to either listen or require someone to use their software. I am frankly astonished at how much “development” gets allocated to new fluff, like exotic animations, and the actual features that make the software usable are ignored. Information lectures do not use exotic animations but we often use many. And so I am waiting for Office 2013. Thank you soooo much for this , I been trying to figure out this on my college and just could not make it , I knew there is a silver bullet and you gave me with that Windows+P .. that’s ALL I needed . Thank you , Thank you .